Candy Rocket Specials: Is home made better than store bought? Is home made better than store bought? Over the last couple of weekends I've been whittling away at a piece of 4mm aluminium to make my own bracket which holds the small diameter after-market gauges in place. 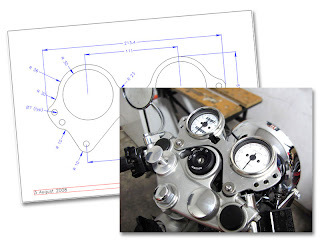 This positions the gauge faces flush with the yoke and at least 50mm lower than a standard bracket. I'm also integrating the warning lights onto the wings on the side of each dial. Making your own stuff is incredibly satisfying even if this is just a small start! Long time - no comments!?! The instrumnet mount looks way cool! Glad to see things moving along!